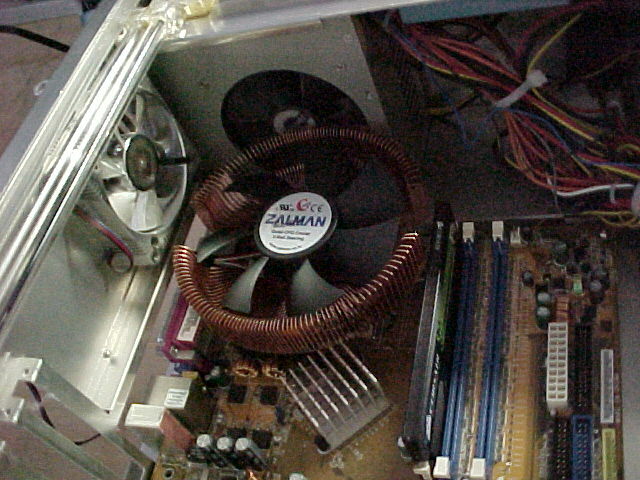 <geekwagon.net />: Zalman 7700 on a Socket A can be done! Apparently I missed the nerd announcement about the release of the Zalman CNPS7700-Cu. Silly me thought it was the same thing as the Zalman CNPS7000-Cu. They look the same, they do the same thing, but there is one minor difference that might be hard to catch when purchasing one of these heatsinks. The 7700 doesn't support AMD Socket A, also, it's freakin huge! My girlfriends computer runs great with with her Socket A Athlon 2500+, but the noisy Thermaltake Volcano 11+ had to go. 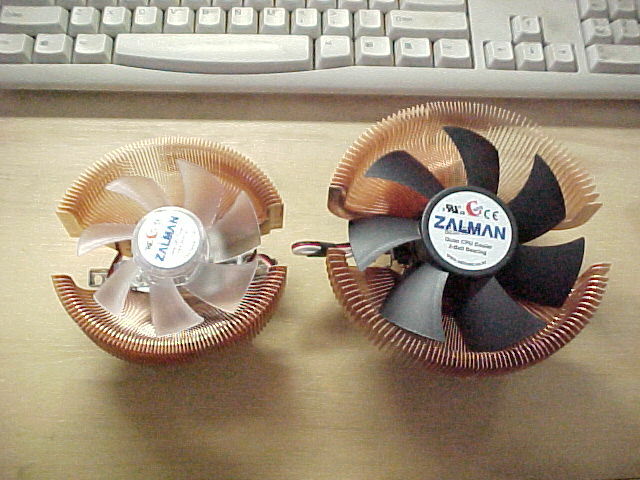 Being a big fan of Zalman, I logged onto Newegg.com and ordered me up a heatsink. 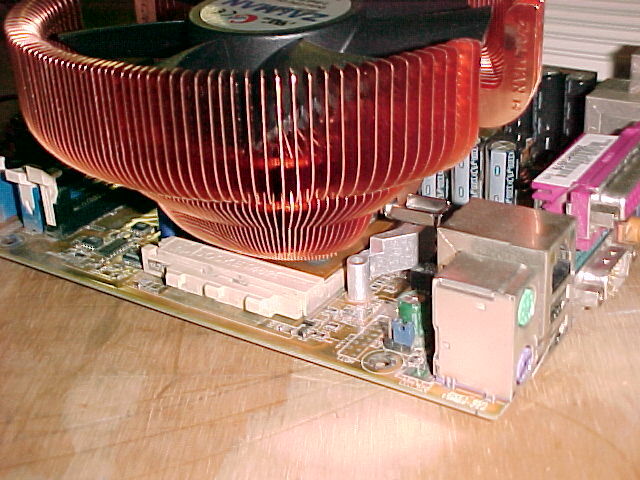 The wrong heatsink. Of course I didn't know it was the wrong one until I was trying to actually put it on my girlfriends Socket A. "Where are the Socket A accessories?" I said to myself. After some on line research, I was sad to see I hadn't done my homework before I purchased the 7700. While doing my post-purchase homework, I discovered that the only big difference between the 7000 and the 7700 was the little aluminum brackets that allowed it to be screwed to a Socket A. Of course it made me wonder if I could make my 7700 fit on a Socket A with the 7000 bracket, unfortunately I had to buy a 7000 from a local retailer to get the bracket. Now having both a 7000 and a 7700 it would be stupid to use the one that's not supposed to go on a Socket A.... but it would be fun. I did think long and hard before actually going through with this little project. Worse case scenario: have to replace girlfriends motherboard and CPU, probably pay for overnight shipping, and have to spend the evening of her being upset with me. I can live with that because the up side was I'd have a freakin' giant heatsink in a place it's not supposed to go! Considering the circumstances, installation went well. I had to remove a fan grill on my power supply to give the 7700 just enough clearance. 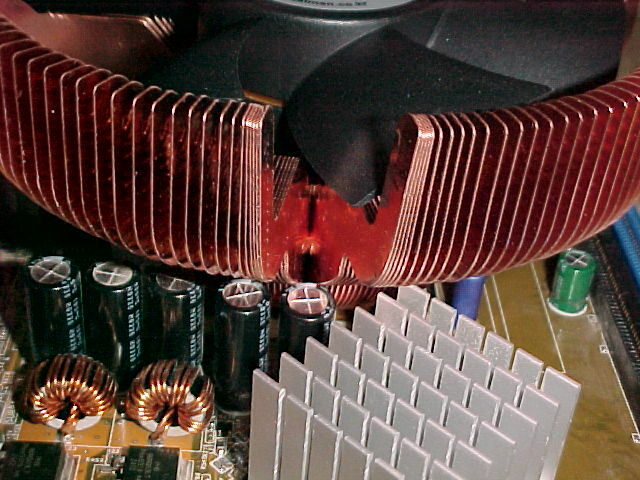 I also had to spread some of the fans of the heatsink so they could fit around a capacitor that was a smidgen too tall. Another draw back was that the heatsink's diameter is so large that it I can no longer slide the motherboard tray out of the case without removing the heatsink. I was worried about the heatsink not making good contact with the CPU, but with her Athlon 2500+ barely cracking 30 degrees celsius under a load I've put that worry to rest (to be fair, speedfan shows it at 35 but the bios shows it at 31). In any case, there is no doubt in my mind this heatsink is a total over kill for this CPU, and in all likelihood I'll one day put the 7000 on there and move this monster 7700 to my 64 bit Athlon. Until that day, it's definitely cool, and nice to know it's possible. I'll admit I was a little upset that you bought the wrong one and instead of doing things the easy way, you had to mod it. Granted it would have been easier, it is 'cooler' to know I have something in my pretty computer now that really shouldn't be there and really, I'm just appreciative that my computer is so quiet I don't know when it is on or off anymore... Thanks for the LED mouse, now I know when we leave it on ;) The glowing heart is always soothing.